In a context of moderate performance in the stock and bond markets in 2007, Funds of Hedge Funds, which are often taken to give an aggregate view of the industry's performance, returned 10.07% on average for the year, compared to 3.53% for the S&P 500 and 4.14% for the Lehman Global US Treasury Bond index. 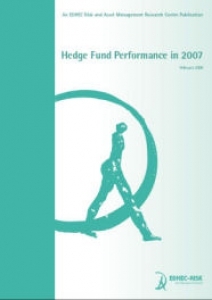 In Hedge Fund Performance in 2007, Véronique Le Sourd, Senior Research Engineer with the EDHEC Risk and Asset Management Research Centre provides a strategy-by-strategy account of the performance of each hedge fund strategy included in the EDHEC Alternative Indexes. While all hedge fund strategies posted positive returns, a majority saw a slight fall-off in performance compared to 2006. Only five of the thirteen strategies obtained higher returns than in 2006: CTA Global, Emerging Markets, Equity Market Neutral, Global Macro, and Short Selling.